Estes Park Shuttle recently took a large group of Peace Corps volunteers into Rocky Mountain National Park for a tour. The group was having a reunion at the YMCA of the Rockies. Since the meeting occurred during the government shutdown, the tour almost didn't happen. But thanks to Governor Hickenlooper and our Congressional Delegation the Park was opened just in time for the Tour. The weather couldn't have been nicer, and the Tour started up at crystal clear, mirror perfect Bear Lake. The Division on Ministries with Young People of the United Methodist Church was holding their annual meeting recently when they took a tour with Estes Park Shuttle into Rocky Mountain National Park, ending up near the Continental Divide for a picnic supper. The group included workers and youth from all over the U.S., the Philippines, Africe and Europe. The conference was held at the YMCA of the Rockies near Estes Park, Colorado. Children from Mountain Top Preschool in Estes Park were taken by the Estes Park Shuttle to MacGregor Ranch Museum recently for a field trip. They fed some chickens, milked a "cow", and got a tractor ride. The Jablonsky family celebrated their family reunion in honor of the parents' 50th anniversary with a tour of Rocky Mountain National Park. The family gathered from all over the world, from Australia to Canada, including many spots in the US. 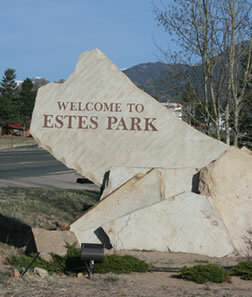 Estes Park Shuttle has new look! !